Just a quick update on what's been going on since the last blog. With summer just beginning and warmer weather on its way (we hope! ), we've been keeping busy with designing and building for lots of new clients. We’ve been working particularly hard on a garden design for a large ‘custom-built’ contemporary house. We’ve also done a little commercial work and several other large family gardens. An important consideration in family gardens is the incorporation of an area for the kids and an adult space for entertaining on a summer evening! The idea of long summer evenings got us thinking about enjoying the garden after dark all year round (an important factor in contemporary garden design is that it can look just as stunning in summer or winter due to lighting placement and the architectural qualities of a contemporary design). So, when a client suggested that they might want a summerhouse from which to enjoy the garden on a cooler evening (let’s face it, without a firepit, heater or several blankets it’s not often warm enough to sit out all evening!) it got us started trawling the web for inspiration. One solution that came up was a high quality shed (don’t let the word shed put you off!). More affordable than an expensive new conservatory, yet they are still stylish and contemporary (we were impressed by a company called ‘Decorated Shed’). If you don’t want to go as far a custom built shed, another option is a firepit. Firepits can either be free standing or built into the ground. 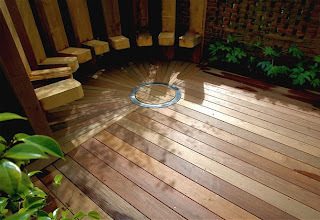 Many of our designs incorporate firepits, with this one (with firepit built into the hardwood decking) being our favourite. Anyway, hopefully the weather will stay warm for just a bit longer! It helps so much for the garden builds.